Sham el Nessim, “smelling the breeze” is an Egyptian national holiday which marks the beginning of spring. It always falls on the day after the Eastern Christian Easter but is celebrated by Egyptians of all religions. Egyptians enjoy the day picnicking, at the beach, in public gardens, by the Nile, or at the zoo. Families color boiled eggs, often in bright colours, and other foods traditionally eaten include fiseekh (salted fish), termis (beans), and green onions. 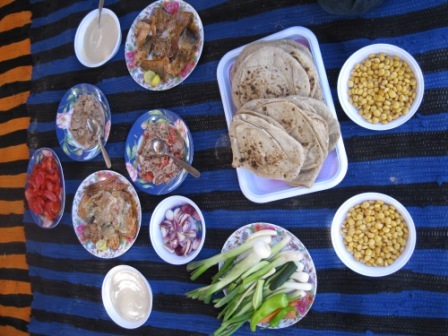 We had our breakfast in the Bedouin tent on the lawn in front of Nature Travel offices.